The Philatelic and Numismatic Office celebrates the pontificate of Pope Francis with the issue of a postage stamp series of four values featuring him during various moments of his ministry. 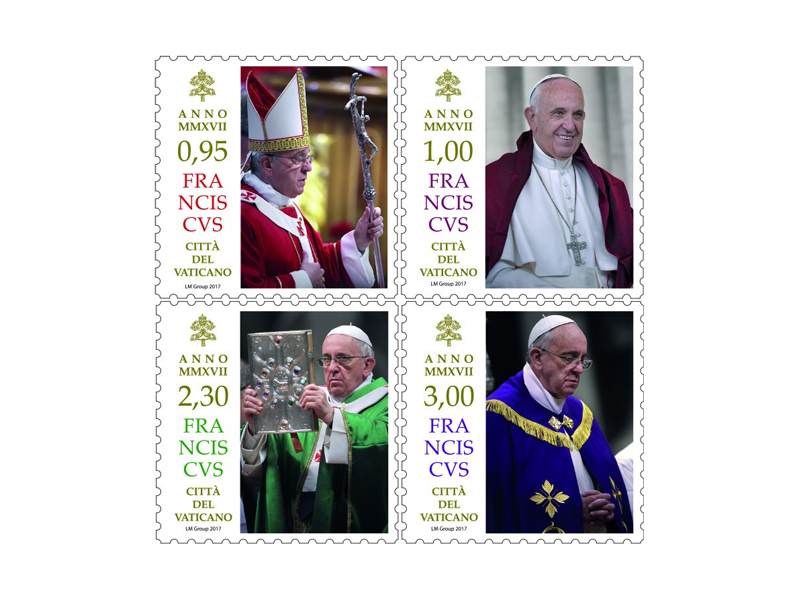 The 2.30 euro cent stamp shows the Pope in the green vestments of ordinary time when he celebrated Mass with the new Cardinals on Sunday, 23 February 2014. On that occasion he noted the importance of listening to the Holy Spirit: “In this moment, together with the new Cardinals, all of us want to listen to the voice of the Spirit as he speaks to us through the Scriptures we have just heard.” The final stamp recalls a moment on 30 November 2013 with the Pope shown in a moment of prayer wearing the purple vestments of the Lenten season. In his homily he prayed that God’s gifts to us might be preserved with his help since our human nature is frail like “earthen vessels” (cf. 2 Cor 4:7).